I have owned CJ for the better part of 16 years and his right hind has always been his “problem” leg. A few years ago, he got a cut on his right hind that I kept clean and wrapped but also treated with light therapy and microcurrent. Once the wound fully healed, his leg swelled up awhile later and he was kept on a course of antibiotics as there was an internal infection going on in the leg. Since then, his hind leg has consistently been thick with a bump of scar tissue on the front of his cannon bone. For one reason or another, his unsightly right hind leg was put on the back burner because other issues would crop up that needed immediate attention. Over the last couple months I have noticed that his hind fetlocks were giving him trouble along with the thickening of his right hind leg and decided it was time to roll my sleeves up and go to work. I have been doing a combination of Microcurrent Therapy (MCT) using the roller attachment on both hind legs and iontophoresis, with an emphasis on the annular ligaments. I continued this combination 2-3x week, alternating between both MCT and Iontophoresis for a month. 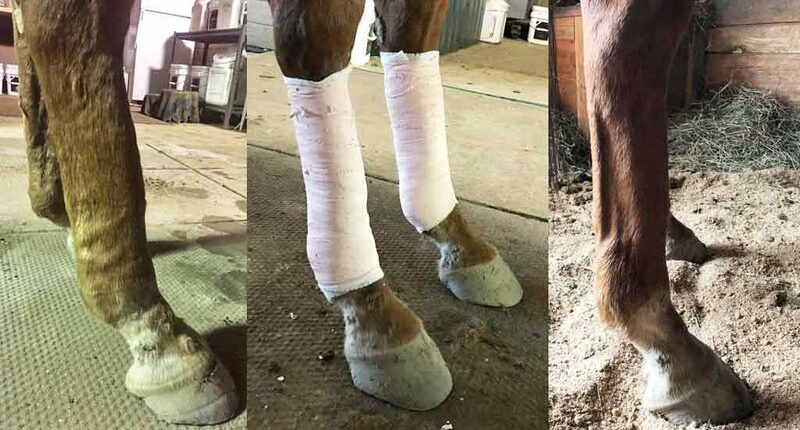 Once I started seeing very positive results, I did an iontophoresis treatment immediately followed by applying support cast; using cast bandaging and Cool Cast poultice wraps. I kept the wraps on for two weeks. While his legs were in the support cast, I continued to use MCT by placing electrodes above and below the cast so that I could still treat the covered area. During the time that his legs were in the cast wraps, CJ had a farrier appointment and my farrier couldn’t have been more impressed! Normally trimming up CJ’s hind legs are quite the chore, but this time CJ was quiet and didn’t get unbalanced or upset in the slightest. Once I took the cast bandage off, not only were his legs tighter, he was also standing more square on with his hind legs. He was even letting his left hind leg rest (he always rests his right hind), and he definitely has more spring to his step! Casts applied to both hind legs. I know that all these therapies work, but they never cease to amaze me. I was hoping to break up scar tissue, support his fetlocks, and make him more comfortable in his hind legs. However, in treating the annular ligaments it totally cleared up the soreness in his hocks, the tightness in his hind end, and the chronic tightness in his lower back. This was definitely a learning curve for me, as I had been treating his hocks, hindquarters and lower back separately for years but clearly wasn’t going low enough. I will be checking ankles and the annular ligaments more closely from now on!